It seems completely illogical. 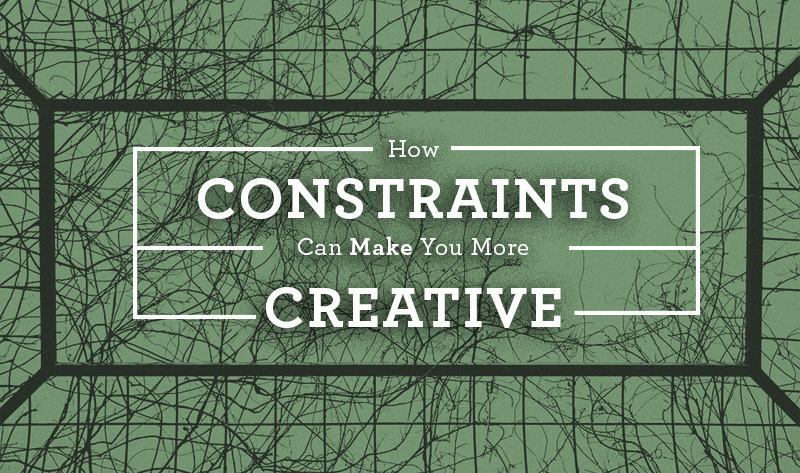 Constrains make you more creative? But they really do. I mean, what is the phenomenon where you can only stare at the blank page and can’t find any way to fill it but an example of having too much choice? Having constraints can be just what you need to choose a direction and really get your creative juices flowing. Not having any restrictions basically amounts to having too much choice and that leads to indecision. That’s actually a well-known phenomenon in psychology. It’s called the tyranny of choice (which I personally think is a brilliant name). The research shows that the more choices you have, the harder it becomes to make one due to the anticipation of regret, which grows with each additional option. Constraints allow us to avoid that problem and thereby sidestep the entire phenomenon of the white page. In this way they can get us going and really churning out the content. And the problem with not having any constraints is that you don’t have a problem. And that, ironically enough, then becomes the problem. By allowing yourself to have constraints, on the other hands, you can fix on how you can circumvent them, adapt them, or turn them into an actual advantage. But that sounds so limiting, some of you will cry. Yes, perhaps it is, occasionally. At the same time, it’s not like you’re committing to a lifetime of that limitation. It’s only for one project. What’s more, if you choose to have different limitations on different projects, you’ll be forced to express your creativity differently. In that way the limitations actually help you stretch your creative problem solving muscles and help you become more creative. Then there’s the fact that restrictions can make you aware of what you do and do not like. If, for example, you decide to only work in three colors, or only write 30-word stories, or take slow shutter-speed photos, and you don’t like the project – well then don’t do it again. That’s obviously not a limitation that you enjoy. If, on the other hand, you find yourself sparked into creativity, then you might have just found a new way to be creative that you otherwise might never have stumbled across. And that can ultimately only ever be good for what you’re doing! After all, there’s nothing quite as bad in the creative enterprise as finding yourself stuck in a rut. So how do you impose limitations? There are many ways. Go look online to see what restrictions other people in your art have imposed on themselves. You might even clue into a common field within your area of creativity. This will give you the dual advantage of letting you see what other people have done, as well as guaranteeing you that will understand what you’re trying to do – heck you might even find that you’ve got a market for a project that turns out particularly well. My daughter keeps crying. I shouldn’t have buried her so close to the house. My mom told me not to speak to strangers. So I stay quiet when they whisper to me from under the bed. Now the great thing about that exercise for me is that it really brought home the nature of a story. I have to set a scene with the first sentence and then transform it with the second one. I spent some time puzzling and transforming concepts to find out what works best and believe that in the process I gained a better insight into the art of storytelling overall. Does this mean I now have a new art form? No. The limits of the art form very quickly became apparent to me. Does that mean I regret trying it out? Absolutely not! It stretched my creative muscles and allowed me to tell a story in a way I’ve never tried before (I’m normally quite verbose). And that’s possibly the most important thing of them all. When we’re being creative in our field, we very quickly develop short hands for how things should be done. Often, these are great as they can make us work a great deal faster and more confidently. But true creativity is never something that is done by rote. It requires that we’re always willing to reinvestigate our assumptions. Yes, when you impose limitations on your art (or other people do), which force you to reexamine some of the assumptions you’ve made about your art, that can often be immensely frustrating. At the same time, if you’re willing to dig a little deeper and explore a little more, it can be quite liberating. You might realize that one of the ‘rules’ about your art form isn’t actually as cast in stone as you had been led to believe. And it is down that road that true innovation lies. Because being creative can never be something we do by rote. It can only ever be something that challenges our base assumptions. Your client wants something done in a certain way? Don’t rail against them. Don’t complain. Don’t hold your head and sigh. Instead, see it as an opportunity to break your style, break your perspective, break your assumptions wide open. It might not work – but that’s the lot of any creative and any project. True genius doesn’t lie in incremental modifications of a familiar theme. True genius lies in leaping into the unknown and trying things differently. And often we can’t see the jump we’ll have to make to get out that way until it has been forced upon us. So embrace restriction and let your imagination soar free within the imposed limitations. After all, what’s the harm? You can always return to the trackless field afterwards. Samantha Brannon is an entrepreneur and freelancer. She is also a co-founder and writing editor at Trust Essays writing service. Samantha loves self-education and rock music. Connect with her via Twitter.